WS Historian™ is an advanced data archiving solution that integrated into WebSCADA systems for Internet automation applications. It captures real-time information from the WS DaqServer and provides open access to historical values for trending and real-time customized production reports. WS Historian communicates with clients by means of Internet. Advanced operational graphics, and sophisticated information management are delivered in a securer Internet architecture environment. WS Historian makes it possible for customers to access production information anywhere anytime using web browsers at their choices. 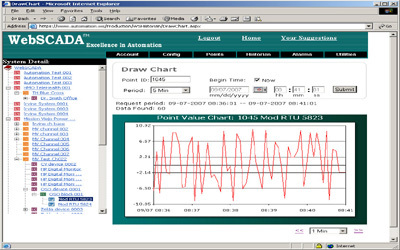 WS Historian is a major subsystem of WebSCADA. Contact us for additional details on how WS Historian can help you improve your information-processing efficiency. ©2019 WebSCADA Corp. All Rights Reserved.